When planning a wedding there are so many decisions to make. 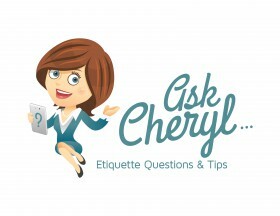 Today, our AskCheryl reader is an organized bride that isn’t sure how much to spend on gifts for her attendants. 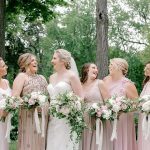 I have an etiquette question regarding the cost of wedding party gifts (I also read your article on the topic). We were planning on paying for accommodation and salon/hot towel barber costs, plus around $40 per gift (in addition to any costs directly relating to the wedding, such as boutonnieres). I’m asking bridesmaids to wear a little black dress and pair of gold heels, any style or retailer. The groomsmen are being asked to wear a dark suit of their own, plus a shirt and tie I will pick out. Most of them are from Kansas City, where the wedding will be held, but now live out of state – several of them also live in Ireland. Additionally, because of the travel factor, things like a bachelorette party or bridal shower will very likely not be able to occur. Given travel costs, but considering what we will be covering, do you think $40 is an adequate cost for a gift? Thank you for your advice! It sounds like you have put much thought and consideration into your wedding planning details. It’s wonderful that you’re covering your attendant’s accommodations and it sounds like you are doing a good job of pampering them as well. It also appears that you’re uneasy about the amount you plan to spend on their gifts; you seemed concerned that it might not be enough. As you know, a gift to your attendants is given to show your appreciation for their love and support. Attendants (especially bridesmaids) often spend quite a bit of time and money being in a wedding. Most often they are happy to do it, but sometimes it does come with a financial burden. There is no “correct or adequate” amount to spend for an attendant’s gift. It really depends on your budget. If around $40 per person is what you can afford, then that’s absolutely fine. However, if you can’t shake the nagging feeling that this amount is too small, you may consider trimming your budget in some other area so you can give your attendants a gift that gives you peace of mind. No matter how much you decide to spend, do your best to find something thoughtful or meaningful, something they might cherish as a memento of your wedding. Remember that the most important element is a personal, heartfelt, hand-written note to accompany the gift you give to each of your attendants. Tell them how much you appreciate their friendship and how lucky you are to have each of them by your side. 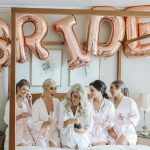 Here’s a recent blog post with some bridesmaid gift guidelines and suggestions- Finding the Perfect Bridesmaid Gift. Personalized gifts are also very popular. I like Mark & Graham and they have free monogramming. In summary, we always want our gift recipient to love our gift, but that’s not really something we can control. Do your best, and then enjoy this special time with your best friends. Wishing you all the best on your wedding day! One Response to Ask Cheryl: How Much to Spend on a Bridesmaid’s Gift?